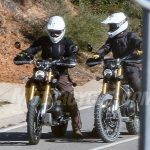 Triumph was recently spotted testing two new Scrambler prototypes equipped with what looks to be the 1200cc Bonneville engine. 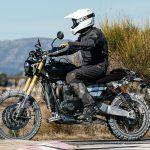 Besides having a larger engine, the new 2019 Triumph Scrambler 1200 looks to be more off-road capable than the 900cc Street Scrambler (which also explains why Triumph added “Street” to the bike’s name). 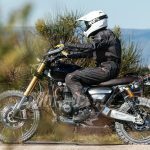 While Triumph’s 1200cc and 900cc Twins look almost identical, we presume the test bikes are using the larger engine because of the presence of dual front brake discs typically reserved for more powerful motorcycles. The test bikes are also equipped with radial-mount Brembo calipers, instead of the Nissins found on most of the other Bonneville family models except the Thruxton 1200R. 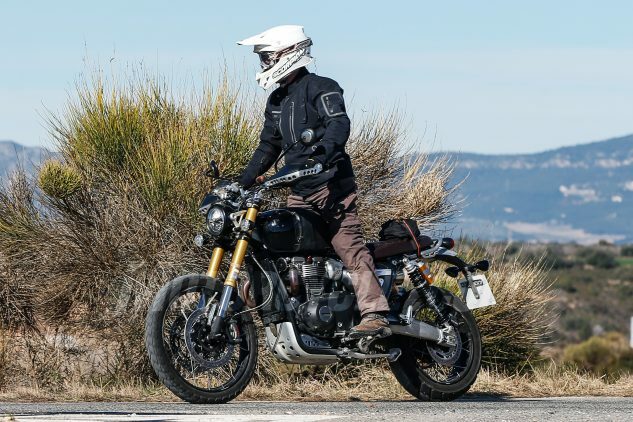 This may also suggest the engine uses the Thruxton’s high-power tuning instead of the high-torque tune used on the other 1200cc models. 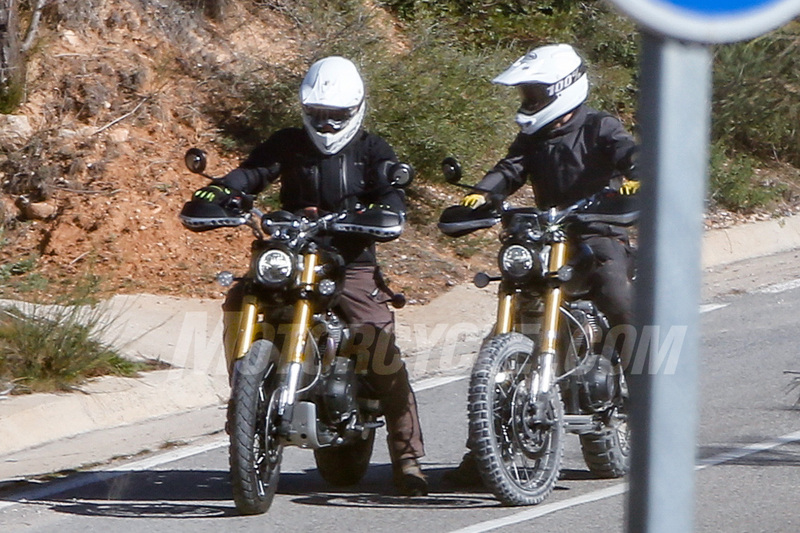 We only have shots of the front and left side of the bike but you can see short curve of the exhaust manifolds and the high-mounted silencers on the right resembling the exhaust system on the smaller Street Scrambler. 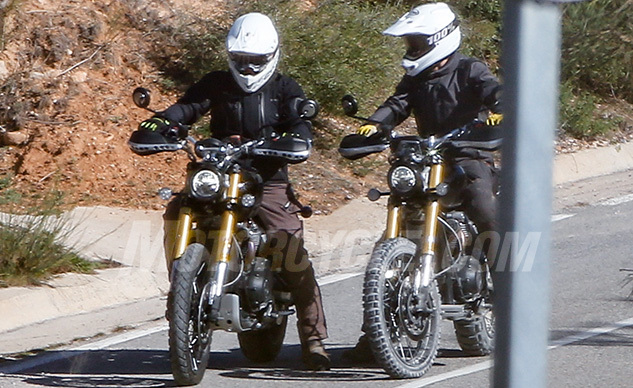 The two test bikes also have noticeably longer suspension than the smaller Scrambler. 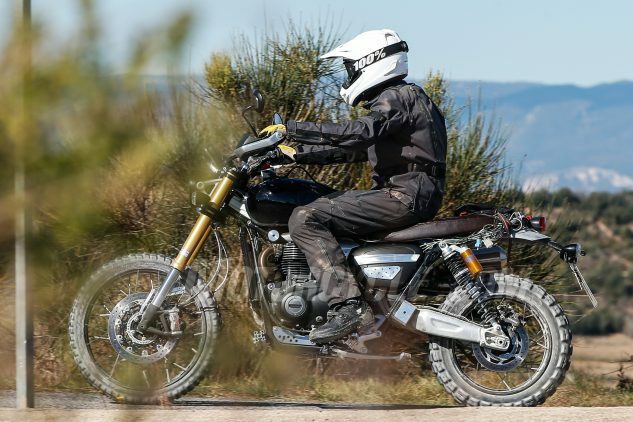 The dual rear remote reservoir Öhlins shocks are equipped with second helper springs, leading to a new cast aluminum swingarm. The long fork also appears to have a longer rake angle leading to a 21-inch front wheel. The tire markings indicate a Pirelli 90/90-21 front tire. 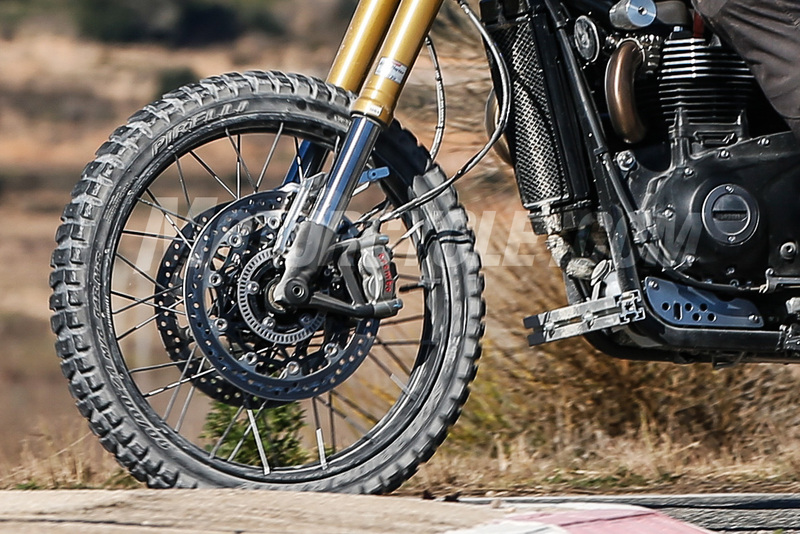 Note how the wire spokes attach to the outside edges of the rim, which means the wheels can be shod with tubeless tires. 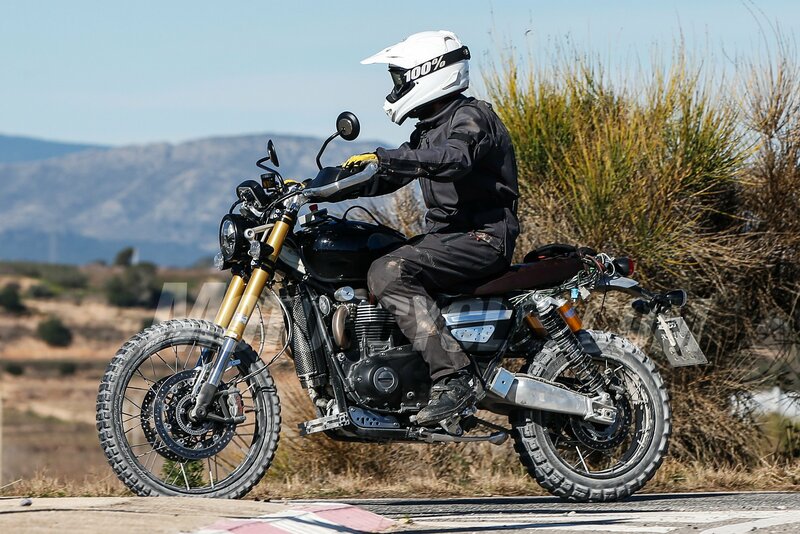 There are some visual differences between the two test bikes, though it’s hard to tell if this indicates two separate versions or if Triumph is merely testing different parts. 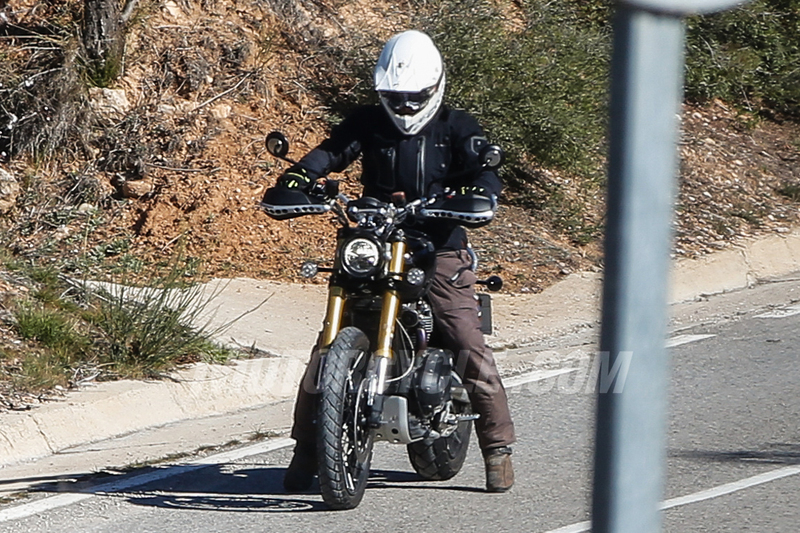 The bike pictured above has knobbier tires, frame sliders and what looks like a metal bar mounted at the bottom frame, perhaps as a makeshift sump guard. The bike pictured below with the rider in a standing position has an actual bash plate and different-looking hand guards. Neither motorcycle has a front fender, but judging from the look of the bike, we wouldn’t be surprised to see a motocross-style high-mounted fender instead of one that hugs the tire. 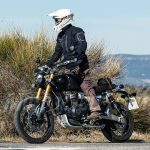 We expect the 2019 Triumph Scrambler 1200 will debut at this fall’s motorcycle shows, either at the Intermot show in October or EICMA in November. 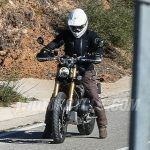 Check back here on Motorcycle.com with more information as it becomes available in the months ahead.